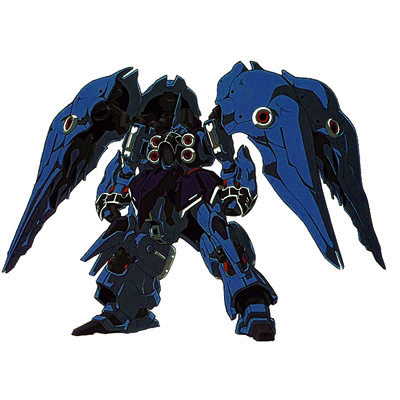 The Kshatriya is an improved model of the NZ-000 Quin-Mantha developed by Anaheim Electronics. When the machine was stolen by Neo Zeon, Anaheim started from scratch on a second unit which would later be commissioned to the Earth Federations Space Forces. An overall improvement on the first unit, the Shudra boasts a higher out-put reactor, better sensors, a more responsive vernier cluster, and the ability to mount two beam gatling guns. The Shudra, much like the Kshatriya is much smaller than the Quin-Mantha but has equal firepower. This is accomplished by the four large shoulder binders similar to that of the Quin-Mantha, each binder storing a pair of mega particle cannons, beam saber holding sub-arms, and six funnels. The main body of the Shudra also has four mega particle cannons and two beam sabers. Although the Shudra lacks the "mega particle deflection system" seen on the NZ-000, an I-field barrier generator was installed instead. The I-Field Generator is a device that produces a Minovsky particle barrier around the mobile suit, capable of deflecting incoming enemy beam weapons fire. Its original psycommu system was also replaced with a more effective psychoframe. The Psychoframe cockpit helps its pilot control the funnels and the suit itself. Although the Kshatriya is a massive mobile suit it has fairly good mobility thanks to the thruster-mounting wing binders. The Shudra is armed with a total of six beam sabers for melee combat. Two are located in the forearms to allow for quick responses to close combat threats, while the remaining four are hidden — together with four sub-arms — in the Unit's binders. These four sabers are likely fall-backs to allow the machine to fight off multiple enemies, or as a trump card to allow it to catch unsuspecting foes off-guard. The generated beams are strong enough to cut through standard mobile suit armor with ease. The Shudra is also armed with two beam-based vulcan guns in the chest, between the Mega Particle Cannons. These are used mostly to intercept small missiles. The unit also sports a grand total of twenty-four funnels for all-range attacks. Each funnel possesses a powerful beam gun that is capable of melting an enemy mobile suit's armor. It should be noted that these funnels are slightly more powerful than the Kshatriya's but at the expensive of the Mega Particle Cannons being slightly less so. Six funnels are stored within each of the Shudra's four binders, and are remotely controlled primarily through use of the psychoframe-equipped cockpit. 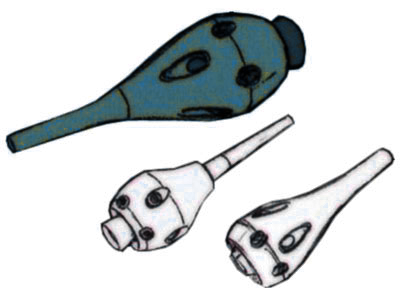 These funnels are used primarily to allow the Shudra to engage large numbers of enemies at the same time, or to allow it to overwhelm a powerful foe. Next, it is armed with an incredible twelve mega particle cannons. Four are mounted on the chest, giving the Shudra great firepower in its forward arc. They can be fired together to create a single and very powerful linked beam, or to fire a scattering beam in a manner similar to a shotgun. Two more of these cannons are mounted on each binder, allowing the Kshatriya to fight off enemies from virtually any direction. Finally, the Shudra can equip two Beam Gatling Guns that are manipulator-operated, Gatling-style beam weapon capable of a high-rate of fire. This fully automatic weapon was equipped by the EFSF. Though initially incompatible to the Shudra's OS, the beam Gatling gun could be recognized through the use of a weapon device driver. While the weapon is capable of unleashing a torrent of beam fire, individual shots are relatively weak. Aside from a blue paint job and the upgraded performance and output, the second model was given a different code name and model number so as to differentiate between the Ksatriya and it. Currently, the MSN-0666 Shudra is the personal unit of xxxxxxxxx.